Left to right: Mr. E. Griffiths, Miss A. Beardsall (Matron); Mr J. Ward, C. H. Riley J.P. (Mayor of Lytham St.Annes; Mr. F. Harrison, Ald W. E. Simpson J.P. (Mayor of Fleetwood); Mr J. Joyce, Sir William Hodgson J.P. (Chairman of Lancashire County Council); Ald T. Clegg (Vice Chairman of the Hospital Committee); Mr R. G. Thompson (Chairman of the Hospital Committee). 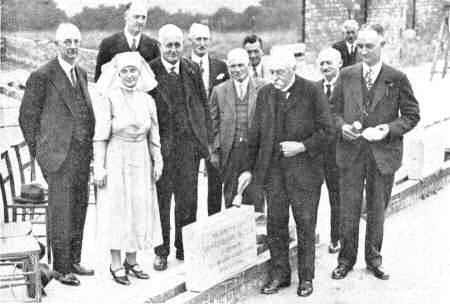 Sir William Hodgson laying the foundation stone of extensions to Moss Side Hospital in 1937.